"A new survey from Vision Mobile and Bluevia finds that Android is the most popular mobile platform amongst developers, with 67 percent of mobile developers indicating they're developing for Android in 2011-that's an 8 percent improvement over 2010." We have a winner, folks! 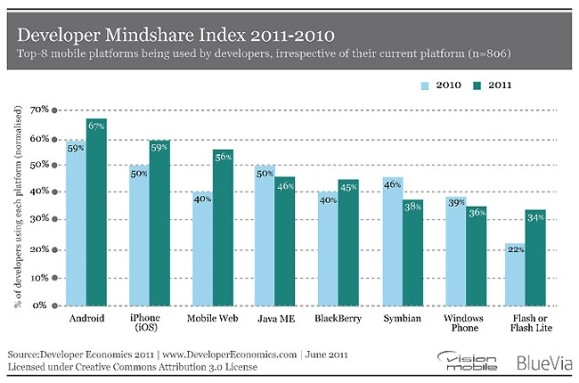 A new survey just released from Vision Mobile and Bluevia found that Android is the most popular platform for developers! But not far behind is development for iPhone. Does this mean that Android is slated to be the market leader in years to come? I've heard a lot of complaints about developing for Android. They say the documentation is terrible and you need to deal with fragmentation among other things. I say fragmentation is one of the biggest draws of Android. You're not stuck with a screen that is too small and you can have a slide out keyboard or even gamepad if you want! I think something like 80% of Android phones are running at least Android 2.2 now so that supports all the major hot features. It could be that one large draw is the fact that you have more than one place where you can distribute your software and one possible option is Amazon - how is that not attractive? Also, you always know you can even post an update for people do download from your website as an apk if nothing else. Some people just may like being in control of when apps and/or updates are published and not crossing their fingers and waiting a week every time.